We find the first account of Friends at Deep River in the minutes of the Cane Creek Monthly Meeting (near present day Snow Camp, NC). The time was the early 1750′s. In 1754 the New Garden Preparative Meeting (Guilford College) granted permission to these Deep River Friends to hold monthly meetings and worship amongst themselves. 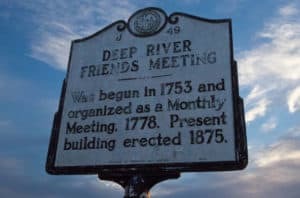 Twenty-four years later, in 1778, Deep River Monthly Meeting was set off as an independent meeting. Friends had moved into the Deep River area from Pennsylvania and Nantucket just prior to 1750. They were followed over the next twenty-five years by a heavy influx that may have raised the population tenfold. In the first decade of its existence, the Deep River Meeting received one hundred and fifty-nine people by transfer certificate alone. Historian Cecil Haworth reports that many of these people came because of disagreements between Quakers and with non-Quakers over issues of slavery, treatment of Indians, and inadequate amounts of arable land for an enlarging population in Pennsylvania and elsewhere. They came seeking freedom to worship and to build a good life. They were serious-minded, hardworking people with a great variety of farming and construction skills, a firm work ethic, traditional honesty, and a powerful sense of independence and self-sufficiency. The existence of the Deep River was an important reason for choosing this location to settle. The first meeting house was built in 1758. It was a barn-like structure of frame construction, and it stood in what is now the southern part of the cemetery. Since Friends had no pastors for more than two centuries, the leadership was vested in the laity and in the volunteer services of itinerant Friends. Deep River Meeting supplied its share of volunteers to this ministry. These early Friends sought a balance between freedom from dogmatic religious beliefs and adherence to a disciplined lifestyle. Beginning with Queries formulated by George Fox, founder of the Society, and altered from time to time, primarily through Advices discussed at the annual meeting of Friends from various Meetings, a guide to behavior was slowly developed that encouraged individual Friends to not be conformed to this world. Marriage to someone outside the Friends fellowship was a major reason for disownment. Dishonesty, drunkenness, oath-taking, and engaging in violence were also reasons for chastisement. Of great importance was that an offender is dealt with kindness and understanding. These strictures began to soften in the early 19th Century. The issues of slavery and the testimony concerning war and peace were central concerns to Friends in the 1840s and 50s. It is not mentioned in Haworth’s history as to whether Deep River Friends assisted in the Underground Railway that spirited slaves northward before the War Between the States, but Cane Creek and New Garden Meetings, to which Deep River had a close connection, were directly involved. To avoid participation in the impending War Between the States, and to escape worsening farming conditions at the time, many Friends left the Deep River area and made their way northwest to Ohio and Indiana. It can be presumed that these were troublesome years for the Deep River Fellowship as well. Concern for children and youth was amply evident among early Friends. Education was valued. Reading was encouraged. Libraries and schools were established. A log school house was built shortly after construction of the original Meeting House. A marker in the current cemetery indicates its location. This was expanded several times. The years following 1866 and the coming of Ezra Meador and Rhoda Worth as teachers were the best years of the school. A First Day (Sunday) School was operating at Deep River by 1857 and by the end of the century there were special meetings for teenagers. This period also developed a multi-denominational interest in revivalism. Some Friends felt called to join this movement and led their Meetings toward more overt evangelism than was customary for Friends. Several other theological and pragmatic differences divided Friends during the second half of the 19th Century. In addition to the evangelical branch, a branch favoring retention of the unprogrammed form of worship and the reliance on lay ministers came into being. A number of the divisions of Friends reunited under the Friends United Movement. Deep River chose to affiliate with this state and national organization and presently affiliated with Friends United Yearly Meeting of North Carolina. Around 1871 a movement began to replace the original building with a larger one. It was a wonder that the old meeting house had not burned down before this time for the stoves were vented directly into the attic. 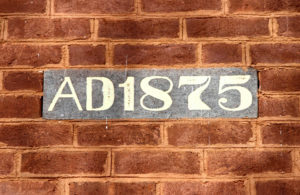 Construction began in 1873 on the new meeting house. All the building materials were secured locally, including the bricks, which were made and fired in a field across what is now Wendover Avenue. On the first Sunday in November 1875, Friends met for worship for the first time in their new meeting house. This building remains today and has been in continuous use as a place of worship. Evidences of the original partition that separated the men and women are still visible under the central aisle carpeting. Also, evidence of trauma to the building following a severe earthquake exists in the long iron rods inserted to stabilize exterior walls at that time. The turn of the century brought major change’s in the acceptance of a designated pastoral ministry. Joseph Potts, in 1891, seems to have been the first pastor. Early pastorates were short term and probably part time. Leslie Barrett in 1917 was paid a salary of $25 a month – hardly enough to have survived on without other work. Another tradition was broken in 1908 with the purchase of an organ for the Sunday School. Musical instruments had been avoided for over two hundred years by Friends. In the 1930s and 40s, this opening to music led to an orchestra of up to twenty people directed by Dr. Ezra Weis of Guilford College. The traditional Friends reluctance to engage in violence left many young men in a quandary with the coming of two World Wars. Deep River men chose differing responses to the call of their country, whatever their choice of service, it was acknowledged and respected by the members of Deep River Meeting. Letter writing sessions by the women keep the Meeting in touch with both those who had chosen a traditional conscientious objector’s stand and those who had joined their friends and neighbors in the armed services. In 1947, the parsonage was built. In 1957 an educational building was added to replace the log hut that previously served. The educational section has been in continuous use for Sunday School classes ever since and in 1989 was expanded with the construction of a new fellowship hall. In 1996, the meeting house and cemetery were registered in the National Register of Historic Places. The issues confronting Deep River Meeting in the latter half of the 20th Century again included war and racial tensions. The War in Vietnam and the Civil Rights Movement touched multitudes nationwide. Again individual Deep River Friends sought guidance in their heritage and in their hearts and felt led to a variety of responses. Individual action was once again supported by the loving acceptance of the total fellowship. The most recent challenge to Deep River Friends has been the rapid change of the surrounding community from a rural, agricultural one where neighbor knew neighbor and many were interrelated, to a major urban complex. The most active growth in Guilford County during the 1990s has been the growth of the Greensboro and High Point toward each other. Malls now are growing up where once grain fields and pasture lands use to abound.